Ruben Mosqueda Punk rock pioneers DEAD BOYS formed in Cleveland, OH in 1976 and they rivaled acts like THE STOOGES and THE NEW YORK DOLLS. While not a household name, DEAD BOYS issued their debut in 1977, Young Loud And Snotty which went on to become a landmark record not only for the band but for the subgenre. The debut album spawned one of the classics of the punk rock genre with “Sonic Reducer”. Their frontman Stiv Bators was charismatic, dynamic and a damn fine prototype of a singer. DEAD BOYS, celebrating their 40th anniversary in 2017, now consists of classic line-up members Cheetah Chrome on lead guitar and drummer Johnny Blitz, they are joined by Jason “Ginchy” Kottwitz on guitar, Ricky Rat on bass and singer Jake Hout who has some mighty huge shoes to fill stepping in for the deceased Stiv Bators. 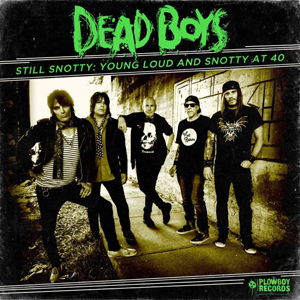 DEAD BOYS circa 2017 have elected to recut Young Loud And Snotty with the revamped line-up under the title Still Snotty: Young Loud And Snotty At 40 sans “Hey Little Girl” and the medley of "Not Anymore/Ain't Nothin' To Do”. Chrome has said recently in interviews that he viewed the Young Loud And Snotty as a demo, which isn’t that essentially what punk rock was? The last thing these bands took into account was the production value; it was about reckless abandon, raw and unadulterated fury. Nashville [Tennessee] based label Plowboy Records has released the recut album in September and DEAD BOYS are currently on a quite extensive tour to promote the album. The verdict on Still Snotty: Young Loud And Snotty At 40 is that the songs are there, they’ve aged relatively well, but don’t quite have the explosiveness [performance-wise] of the original recordings. Bands take note: don’t do this, make new music instead. If you purchased this album and liked it make the effort to find the original. Then tell me that you didn’t adore the original more. All in all Still Snotty will serve as a decent document of the current incarnation of DEAD BOYS.